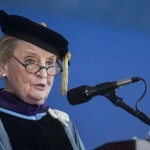 Albright praises the Tufts community for its activism during her commencement ceremony address. You have stood up on behalf of workers, you have spoken out against the scourge of sexual assault, you have made clear that black lives matter, and you have pressed for action on climate change. All I see are doers … when I tell you the world needs you, I really, really mean it. I wanted to use the fine education I received for more than meaningful dinner conversation. I wanted to give something back to this country that had given so much to me. I insist that you put your opinions to the test, when required, you dare — as Tuft’s motto suggests — to be voices crying for peace and light. Because your choices will make all the difference to you, and to us all.